Garrett Wonders was born and raised in Warren. He grew up riding his bike all around the west side. As a 7thgrader he was known for racing the school bus on his bike to see who could get to Turner Middle School first. Most of the time he won. Garrett spent the summers swimming at the Olympic Club, running in local races and riding his bike. He and his friends even built a 7 foot long skateboard one summer and spent a lot of time trying to figure out how to ride double! He loved to work on, and fix, anything mechanical. Garrett was a 1997 graduate of Warren G. Harding where he was the Raider mascot for 4 years, played in the band, was the captain of the swim and cross country teams, National Honor Society Member and Boys State Representative. Garrett received his degree in Engineering Physics in 2000, followed by his Masters in Nuclear Engineering in 2001. Both were from The Ohio State University. One summer, while at Ohio State, he planted pumpkins to give to all the neighborhood kids at Halloween. His love of cycling grew as he started to compete in triathlons and cycling races throughout his college career. In 2001 Garrett was commissioned to the US Navy and moved to Charleston, SC to teach at their Nuclear Power School. 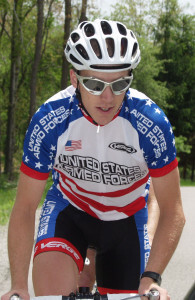 During his time in the Navy Garrett was proud to represent the Navy on the US Armed Forces Cycling team. While on the team he was able to race in big races, such as US Nationals and stage races in Germany. In 2004, he was selected to represent the Armed Forces in the US Olympic Trials. He was, in fact, on a solo training ride when he was struck and killed. Garrett inspired many in the Southeast region and played a major role in the revitalization of cycling in that area. A testament to this is the naming of a bicycle lane on the newest bridge in Charleston. It is named “Wonders Way.” He left behind a wife Terri Elliott Wonders, parents John and Shelly Wonders, a brother Jesse, and his family, and many relatives and friends. In 2010 he was inducted into the Warren City Schools Alumni Hall of Fame. He will be forever in our hearts.